YHWH is God’s actual name which he revealed to Moses from the burning bush, it implies the personal nature of God. No. It does not mean God is boring. The word bore is pronounced boray, wirh a short o.
I once read a book called an Agnostic’s Apology by Sir Leslie Stephen K.C.B. a philosopher and former Anglican minister. Sir Leslie’s premise is that we cannot know the existence of God s God does not reveal himself, nor is revealed in nature. I am not a philosopher so I will not dispute that directly, but I will say that we can see the effects of this presence. This is subjective, not objective evidence, but I believe that it is no less real because of this. I was agnostic when I started studying physics at university. Not a strong agnosticism as in Sir Leslie’s 19th century book, I just did not think God was relevant. But I got friendly with someone in the university folk club who shared accommodation with two members of the Christian Union. I started asking questions in mid March 1974 and a sermon heard on the Sunday after Easter that year was a major step on the way to being a Christian by term end. In that time I heard about people being healed. 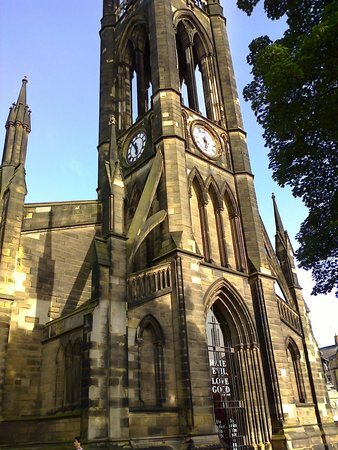 In a meeting at STOMP, a student service at St Thomas’s Church in Newcastle city centre, between the two universities, I heard of a 7 year-old boy in the local area who prayed in tongues for a friend who fell from a wall and healed him. I understand that this is hearsay, and does not count as evidence. In the many years since I have very occasionally witnessed people being healed, and have been asked to pray for people and been amazed that God would answer my prayers. I have no evidence of medical diagnosis from before or after, so this is subjective evidence, and even if I had, the evidence would still be a third party report. Even so with testimonies of healing heard in our church and elsewhere I am convinced that God is neither absent or inactive in the world. What has this all to do with God being the creator? The nature of God, existing independently of the universe he created yet active in that same universe. God is not part of the creation he made, and as such scientific investigation of the created universe will always be insufficient to find God. God is the creator and was not part of the universe he created until he became incarnate in Jesus Christ. All three members of the Trinity were and are involved in creation. The Genesis story has the Spirit of God brooding over the chaotic early world, and the preface of John’s Gospel says that nothing exists that has not been made by the Word that became flesh, referring to Jesus Christ. I find the formula of the Trinity used by some of creator, redeemer, sustainer to be less useful than the traditional formula of Father, Son, Spirit. I understand this sounds paternalistic, I have mentioned how some of the names of God I have already looked at use feminine words or imagery and the Hebrew word for Spirit, Ruach, is feminine. But to leave the work of creation to the Father alone seems just plain wrong to me. Jesus and the Holy Spirit are clearly seen as active in creation. But there is nothing that exists that God has not made. That includes you and me. You are part of God’s creation and God longs to be in a relationship with you. If you have a relationship God longs to go deeper with you.